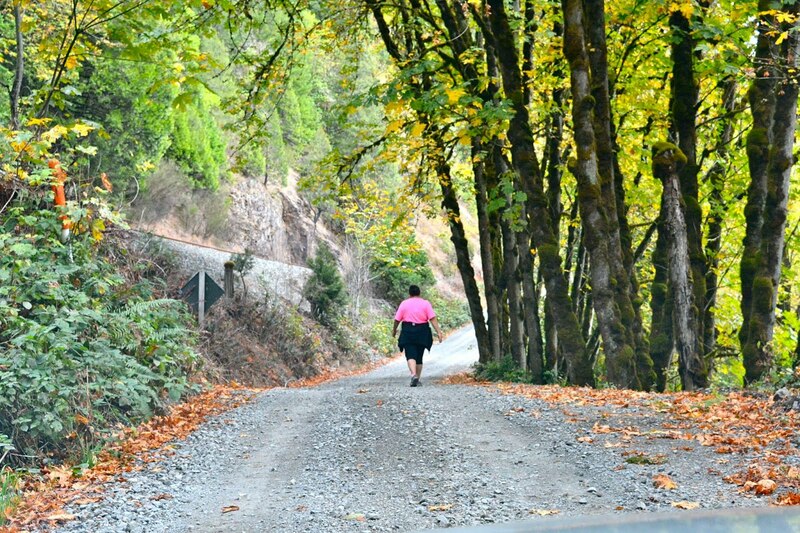 OAKRIDGE, Oregon (October 4, 2016) -- Last weekend marked the first year of the Molalla Ancestral Run. On Saturday October 1st, members of the Chakgeenkni-Tufti band of Molalla Indians called for ceremony in response to the recent proposal to turn our ancient village site in to a gravel mine in Oakridge, Oregon. During times of great burden it has been a tradition of our people to join together in ceremony and prayer. We are retracing an ancient route of our ancestors and honoring them in the process. Rather than focus on negativity, we have chosen to rejoice in our ancestry and shared history in Oakridge as tribal people and settlers. We have chosen to uplift, support and share with each other during this time. Many of us have children and grandchildren. We don't want our precious homeland turned into a quarry mine. We want to pass down the beauty of this land to our future generations. If this quarry mine is approved our ancient Molalla village site will be irreversibly damaged forever. The 35-mile journey from Lowell on North Shore road ended at TV Butte in Oakridge at the proposed quarry site. The ceremony connected recently mined Parvin Butte in Dexter to TV Butte in Oakridge, which is currently proposed to be mined. Both Parvin and TV Butte are culturally significant to our Molalla Tribal band. Confederated Tribes of Warm Springs member and descendant of Charlie Tufti, Kayla Godowa-Tufti joined in a closing prayer with residents of Oakridge and members of the Save TV Butte group at the proposed quarry site at sunset. With an offering of sage and cedar, we passed around an eagle feather and abalone shell in gratitude of our ancestors. Few are aware of Ed King's (King Estate Winery) unsustainable investment in the Old Hazeldell Quarry (OHQ) project in Oakridge, Oregon. Currently forestland, TV Butte is proposed to be rezoned to open a quarry. 18- million tons of andesite aggregate rock will be extracted from TV Butte for road paving projects for 50 years. Andesite rock when crushed, creates silica dust. Silicosis results in permanent lung damage. Silica dust particles become trapped in lung tissue, causing inflammation and scarring and reducing the lungs' ability to take in oxygen. Symptoms of silicosis can include shortness of breath, cough and fatigue. This issue is among several health hazards local residents and employees with be forced to live with. "To protect natural resources and conserve scenic and historic areas and open spaces. Local governments shall adopt programs that will protect natural resources and conserve scenic, historic, and open space resources for present and future generations. These resources promote a healthy environment and natural landscape that contributes to Oregon's livability." Historical, cultural, natural resources and aggregate rock are among several Goal 5 resources under Oregon law. These Goal 5 resources conflict with one another. Though aggregate rock is considered under Goal 5, so are natural, historical and cultural resources. A mining operation would jeopardize natural resources such as fish, game and clean water as well as cultural and historical resources significant to our tribe. The Old Hazeldell Quarry mine is not an effective use of Oregon's statewide planning goals and guidelines under Goal 5 and does not justify rezoning TV Butte from F1 and F2 forestland to quarry. On the proposed quarry site is the old Oakridge city dump site that was established before the Department of Environmental Quality. Residents who wish to remain anonymous have confessed to placing multiple hazardous materials in the old dump site. Pope and Talbot who owned a mill site near TV Butte dumped their hazardous waste at this dump. Penta is among one of the disclosed hazardous materials known to be under the dirt and overgrown blackberry bushes at TV Butte. Ed King and the Old Hazeldell Quarry project plan to build a new access road through the old dump site for their gravel trucks. OHQ also plans to place their rock crusher on top of the old site where toxic materials are known to be located. Disruption of these unknown hazardous materials could cause a leak or explosion. There is only one road in and out for the local residents who live near the proposed quarry site on Dunning Road. Fresh water supplies could be threatened from Oakridge to Portland, Oregon VIA the Willamette River in the event of a leak. Once U.S. Forest Service land, the property of the proposed quarry site is known as TV Butte on Dunning Road. This is the original location of the town of Oakridge, once called Hazeldell. 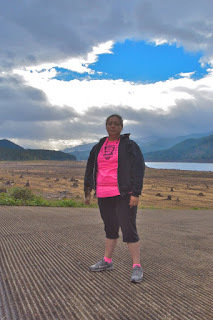 Historically, the property was utilized by the Chakgeenkni-Tufti band of Molalla Indians and several other local tribes for thousands of years. Klamath, Kalapuya, Warm Springs, Wasco, Klickitat, including other tribes camped at TV Butte to gather foods such as camas, elk and huckleberries. Within the proposed quarry site, it is a fact there is a trail that was frequented by tribes for at least 500 years. Ancient materials have been found on the property such as arrowheads, stone grinders and baskets. There is a known Molalla burial ground nearby. Our great-great grandfather Charlie Tufti, member of the Chakgeenkni-Tufti band, was awarded donation land claim adjacent to TV Butte in 1884. Molalla tribal member Jim Chuck-Chuck also owned land next to the proposed quarry site. In the late 1800's Charlie Tufti met and married Lucy Tufti and moved to the Warm Springs Indian Reservation where the Tufti family are currently enrolled members. Lawrence Hills, mayor of Oakridge (1958 and '63), built a historical marker, a cabin at Greenwaters Park off Hwy. 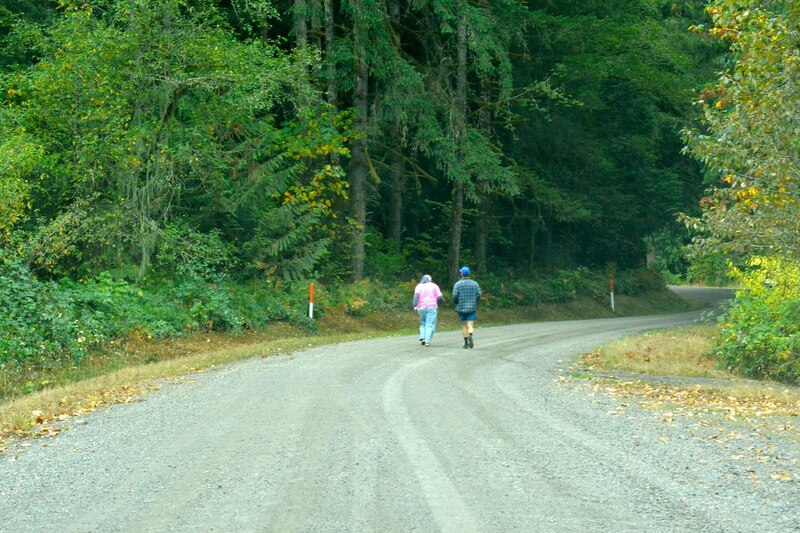 58 that states, "Dunning Road is an ancient Molalla Tribal site." This information is framed with a photo of Charlie Tufti. It states Charlie Tufti was "well known in the area, gentle in nature." 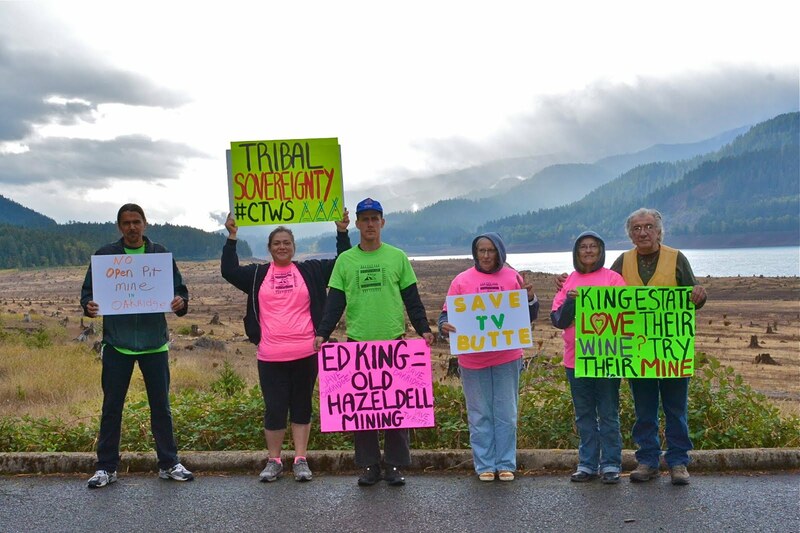 Our Molalla tribal band has called for a boycott of King Estate Winery and all investments of the King family. 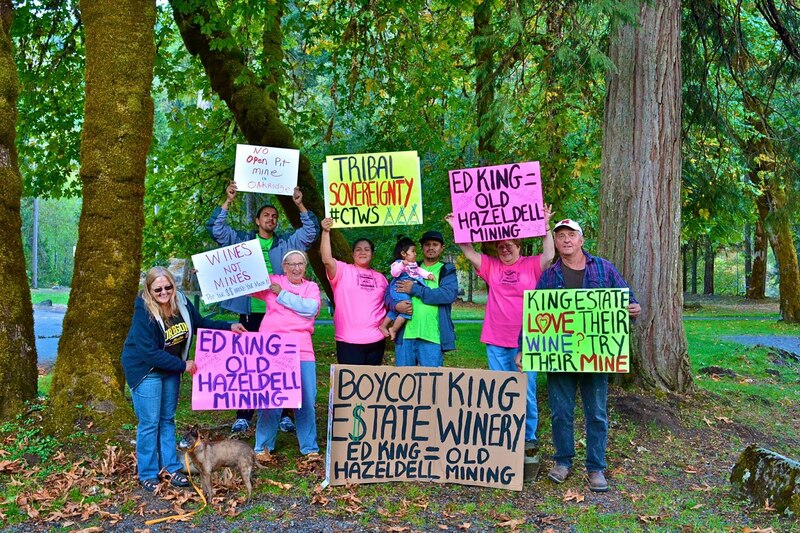 King has deceived the citizens of Lane County by drawing attention to the "sustainable," "local" gimmicks of the winery, meanwhile hiring staff and legal representatives to open an unsustainable mining operation in Oakridge that will locally contribute to irreversible environmental damage and climate change. King Estate Winery proclaims to be on the path to being the nation's largest bio-dynamic winery, which provides Ed King a glossy green-washed cloak to lurk behind. Though spokesman for the Old Hazeldell Quarry Project Phil Donovan has claimed OHQ and King Estate Winery are completely separate, they are backed by the same owner and investor, Edward King. June 2006, Greg Demers purchased the property in partnership with Ed King. The property was purchased for $3,731,000 from Murphy Lumber, which had used the property to harvest timber since the '70s. Though spokesman for the Old Hazeldell Quarry Project Phil Donovan has claimed that the proposed quarry site is not and never has been owned by Mr. Demers, public record proves otherwise. According to the Warranty Deed Statutory Form for Lane County, all tax statements for this parcel are to be mailed to P.O. Box. 1042 Veneta, OR 97487. Though Phil Donovan claims Greg Demers involvement in the property is irrelevant to the merits of the proposed quarry mining application, this is completely false. Mr. Demers has a horrendous environmental damage record. He evades responsibility for those damages. Demers's unsustainable business practices are destructive to our ancestral territories in Oregon. In his Sept. 29th column entitled "Defending Old Hazeldell," published in the Eugene Weekly, Phil Donovan argued that the Old Hazeldell Quarry site, which is currently the subject of a public land use process with Lane County to allow quarry mining, is not culturally significant to local Native American tribes. There are a number of factual inaccuracies that merit a response. Phil Donovan states, "Godowa-Tufti also claimed that an Indian trail cuts through the site, that ancient materials have been found on the site and that there is a "known burial ground nearby." Her claims have been thoroughly responded to by a well-respected, Eugene-based nationally certified archeological firm, Heritage Research Associates. Its report may be found at oldhazeldell.com." Ultimately, Phil Donovan spokesman for the Old Hazeldell Quarry project is nothing but a paid mouth piece for Ed King who is not willing to speak on his own behalf. No staff member of the Old Hazeldell Quarry Project, Lane County or Heritage Research Associates has the authority to determine what is culturally significant, relevant or important to local tribes. Phil Donovan's claims on behalf of Ed King and the Old Hazeldell Quarry project further prove the fact that this company and its employees have no respect for our tribe's sovereignty or autonomy based on their spokesman's intrusive unfounded public claims. Every shred of what I know to be fact about my tribe and our residency at the TV Butte area in Oakridge, Oregon can be backed by official documentation. Below, I have provided excerpts from these documents to support my statements. It has been a dehumanizing, degrading experience to have archaeological "experts" Linda Hart and Kathryn Toepel at Heritage Research Associates discredit everything factual about our tribe's residency at TV Butte. Furthermore, to have Lane County and OHQ employees treat our tribal members as if we cannot be experts on our own cultural identity and history is morbid. Toepel stated that there were artifacts found in the 1500' buffer zone, but she conveniently maintained nothing was found in the project area which is approximately 100 acres. 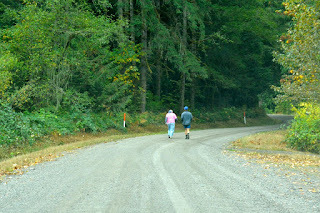 Archival research conducted at the Lane County Historical Museum (LCHM) in Eugene, where Linda Hart's husband has been director for the last 13 years, has revealed that there is in fact a significant and irreplaceable section of the "Old Indian Trail" that is located inside the subject property and contiguous ownership. 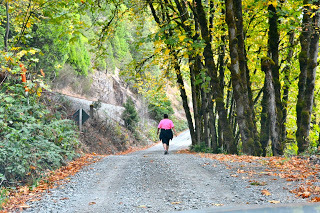 This trail is at least 500 years old and was used frequently by several tribes in the area including but not limited to Molalla, Kalapuya, Warm Springs, Klickitat and Klamath peoples. The following is an excerpt from a recording of a school tour through Oakridge area with Lawrence Hills, Mayor of Oakridge 1958 and 1963. The date of recording is May 13th 1988. It was conducted as part of the Oral History Program at the Lane County Historical Society and Museum. Referenced specifically in the following are pages 8-13 of the transcription. "This is the end of the old Indian Trail that we are sure.. we were sure of. There are a lot of trails around here but we know that this one was 500 at least 500 or maybe older. I heard that Murphy Logging Company were.. was logging the old Indian Trail and it must come out here on this level ground. I came I got word that they were cutting timber up here and when I got here the old Indian Trail was ruined. Just recently we lost to the hungry loggers one of our treasured spots, what we called "The Old Indian Trail." We believe it might have been used by many Indian tribes and could easily be 500 or older years of use. One reason I liked the Old Indian Trail so good was people by the name of Dunning lived up here where we are going to turn around. I would walk up that Old Indian Trail and go up and see my friend Raymond Dunning. When I come up here and heard they were logging the area, I came up here and pretty near cried thinking about how the youth could be on that Old Indian Trail." "While I was visiting the Dunning people who was here after Charlie Tuftie (Cough) Charlie Dunning and I were real friends. I was a friend of Charlie's father and I said to him one day, I said to him, well there was Indians on this area wasn't there Mr, Dunning? And he said, Yes, this was an Indian country. I said, how do you know about Indians. He says, "well when you cull the area over here, he says, there's a graves over there, and he said the reason I know is because when they dug the hole to bury the Indians there was a strip of white ground underneath and that's, that's not uncommon. You can dig down a lot of places and find white ground further down. So when they dug the hole they throwed the dirt up and when they got to the white stuff, it got in front. They throwed it over the back and then when they covered the hole the white stuff was on the top. He says when you could count the graves from when you caused the land, you count the graves and I think he said there were seven. So that is pretty much the story of Charlie Tufti." "Sometimes as many as a hundred Indians might be camped in the Camas swale that is now First St.
Or on the glacial valley to the east where the Dunning Ranch lies. Other tribes often came from Eastern Oregon to hunt in the Calapooya Range. Their trail over the mountains were well defined and were still in use well into the twentieth century. At the time of first settlement in this area, a band of about 20 Indians were fairly permanent residents here. Their home was in the high valley east of town, now the Palanuk and Dunning ranches, where five of their graves many be dimly traced. When the white men acquired this land legally, years later, they were instructed by the remnant of the tribe, "When you plow right over it, leave no mark" and so it has been done. The color and texture of this disturbed soil are the sole monuments of these displaced people." Phil Donovan maintains, the recent cultural survey conducted by Heritage Research Associates is consistent with the U.S. Forest Service's similar reconnaissance of the site in the early 1990s. Donovan claims the U.S. Forest Service found no evidence that would support Godowa-Tufti's facts. July 31st 2000 Scott McAleer prepared a Report on the Historical Native American Land Use in the Middle Fork Willamette River Valley, Oregon: Charlie Tufti and the Molalla of the Middle Fork. This 61-page report is a thorough documentation of our tribe's historic use and habitation of the land in the Oakridge area including the TV Butte site. This report was prepared for the US Forest Service. They are well aware of our historic habitation of the proposed quarry site. -The Story of Charley Tufti (As told by Mary Stewart (Warner) Neet of Fall Creek, Oregon. -Diary of Helen Stewart 1853. Reproduced by Lane County Pioneer Historical Society, 1961. -Toepel, Katheryn Anna, and Beckham, Stephen Dow. Historic Use of Six Reservoir Areas in the Upper Willameete Valley, Lane County Oregon, prepared for the US Army Corp of Engineers, Portland District, Heritage Research Associates, 1982. 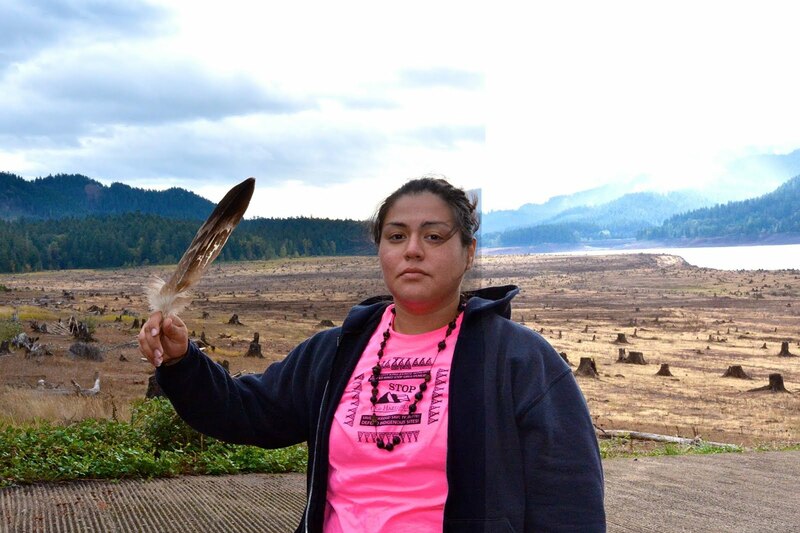 The Old Hazeldell Quarry Project is a direct threat to our tribal sovereignty, cultural identity and right to defend our ancient village sites as Molalla people. 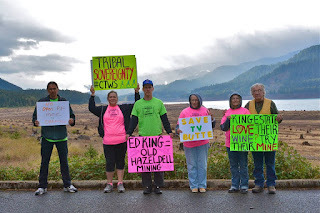 Ed King's mining project will desecrate and irreversibly damage an irreplaceable historical site to our tribe. Written comment is currently being accepted. Next public hearing with the Lane County Board of Commissioners October 12th at 6 p.m. In Oakridge, Oregon at Oakridge High School Carver Auditorium. Written Comment may be submitted at meeting. "at the time of creation the Creator placed us in this land and He gave us the voice of this land and that is our law." 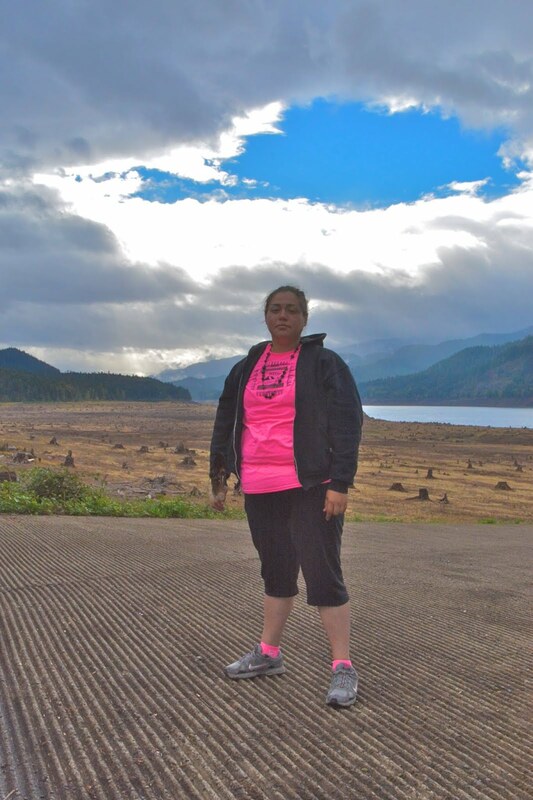 On her father's side, she is a member of the Confederated Tribes of Warm Springs of Oregon and a descendant of the Chakgeenkni-Tufti mountain band of Molalla Indians. An Indigenous rights advocate and freelance journalist residing in Kalapuya Territory, Oregon. I live on McFarland and I may have an old indian Trail tree on my property can you give me any place to find more information about this. I 100 percent support you in your efforts to stop this stupid quarry.